Make a purchase today for your chance to get away. 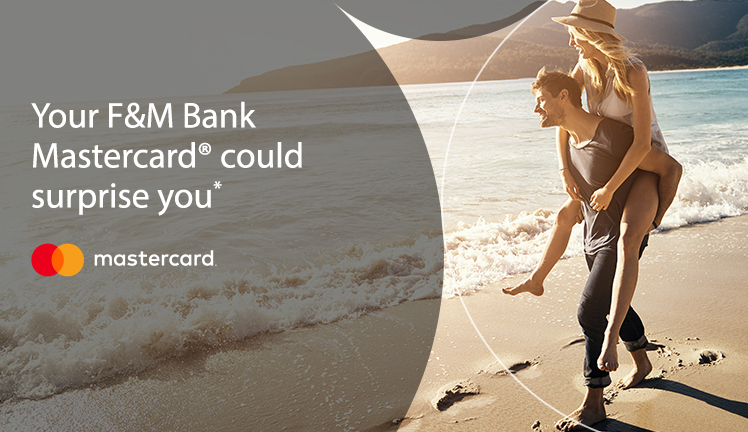 Now through March 31, 2019 your Mastercard could be your ticket to incredible surprises. Every time you use your card*, you will get a chance to be surprised with a trip to one of five incredible destinations – including Hawaii. And one F&M Bank customer will win a $500 statement credit! *No Purchase Necessary. Void where prohibited. Open to U.S. cardholders, 18+ as of 1/1/19. Debit PIN & International transactions ineligible. Business card holders also ineligible. Ends 3/31/2019. Restrictions apply. Click here for Official Rules and complete details. We've added precautions to keep your debit card information safe. Manage finances, streamline your transactions, and maximize control of your cash flow.